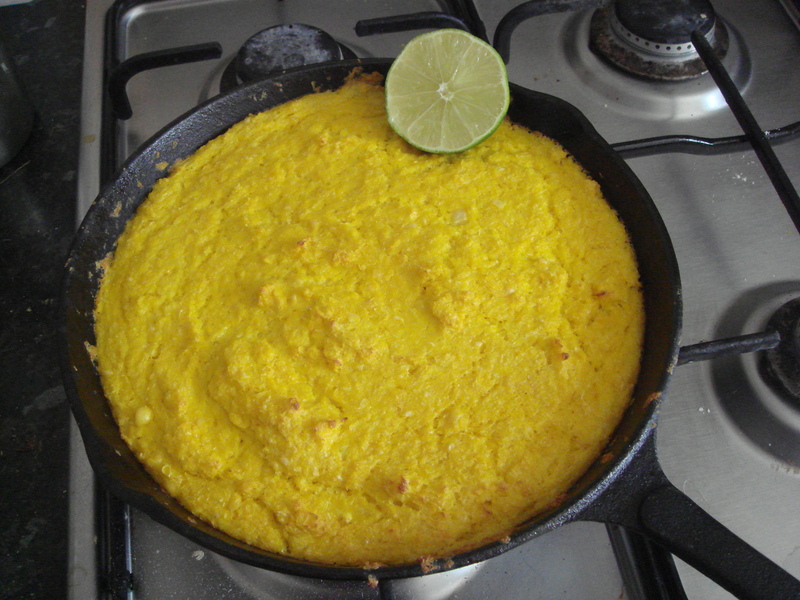 I read a recipe for the ‘simplest corn pudding‘ in the New York Times. It was indeed simple, consisting of no more than grated corn, baked in the oven, the milk of the corn thickening in the heat of the oven and providing the pudding it’s structure. I was slightly sceptical but intrigued. However, I hadn’t seen much fresh corn at the market so I emailed the recipe to my friend Emma and forgot about it. More or less. It turns out that the market was bursting with squeaky-fresh, unshucked ears of corn the next time I went. I bought ten and started grating them as soon as I got home. The recipe says to cook the corn in a cast iron skillet. Such skillets seem to be ubiquitous in the US but are not as common here in the UK. Still, I have one, a hefty 24cm/10 inch little number I picked up for about £13 at Nisbets on Shaftesbury Avenue, and they can be bought online at Amazon.co.uk. I don’t know if it’s crucial to the recipe that you use a cast iron skillet if you really don’t want to or can’t get hold of one. A pyrex or metal baking tin should be fine, though it might have less of a crust. As can probably be expected the taste of this was very clean and pure, the corn sweet and deliciously caramelised at the edges. I ate some for lunch and it reheated fine for dinner as well. The butter, lime juice, salt and chilli powder (or cayenne) is crucial to bringing out the sweetness and corn flavour, in my opinion. 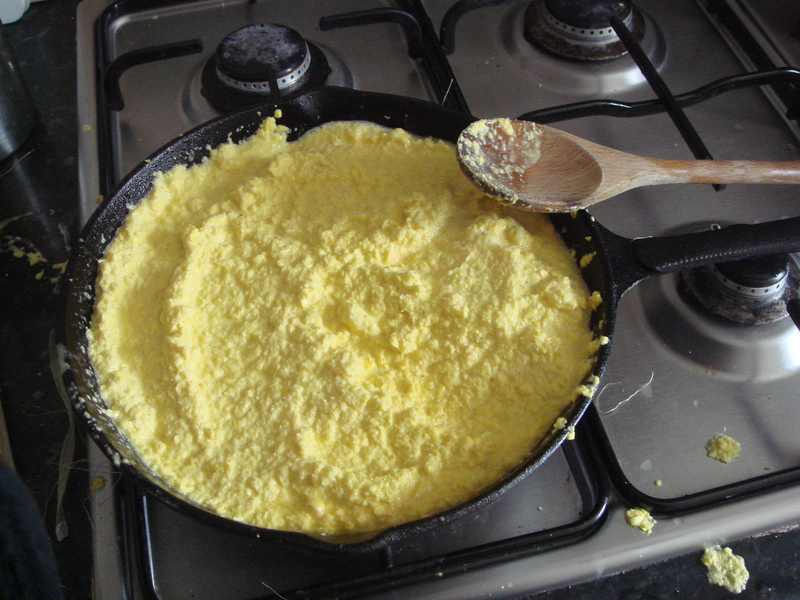 To my surprise the grated corn and milk thickened to a thick, spoonable, bready consistency – showing that you don’t need fillers such as milk, egg or flour. One last point: there is a LOT more corn on one of those cobs than you might expect! It took a good bit of grating to get down to the cob. Also, be careful: the corn is wet once grated and I cut myself when my hand slipped on the grater. 2) Using the fine side of a box grater, grate the corn directly into the skillet. Discard cobs. 3) Once finished, spread out the corn evenly across the pan and bake in the oven until the corn is thick and firm and the pudding is golden on the top and edges. This took 30 minutes for me.